Connected home (also known as smart home, or home automation) involves the control and automation of lighting, heating, ventilation, air conditioning and security, as well as home appliances such as washer/dryers, ovens or refrigerators/freezers. Modern systems generally consist of switches and sensors connected to a central hub from which the system is controlled with a user interface, often via the internet. The connected home market is predicted to be worth almost US$150 billion globally by 2020, representing 35% average annual growth over this period. We reached out to some of the top influencers on our list to ask them for their views on connected home. We spoke to Evan Kirstel (#1), Andreas Staub (#2), Carley Knobloch (#5), Christopher Danvers (#7), Fabienne Neymarck (#10), Glen Gilmore (#11), J Michael Palermo IV (#16), Tamara McCleary (#14). Be sure to follow them to stay up to date on the best content and resources on crowdfunding. 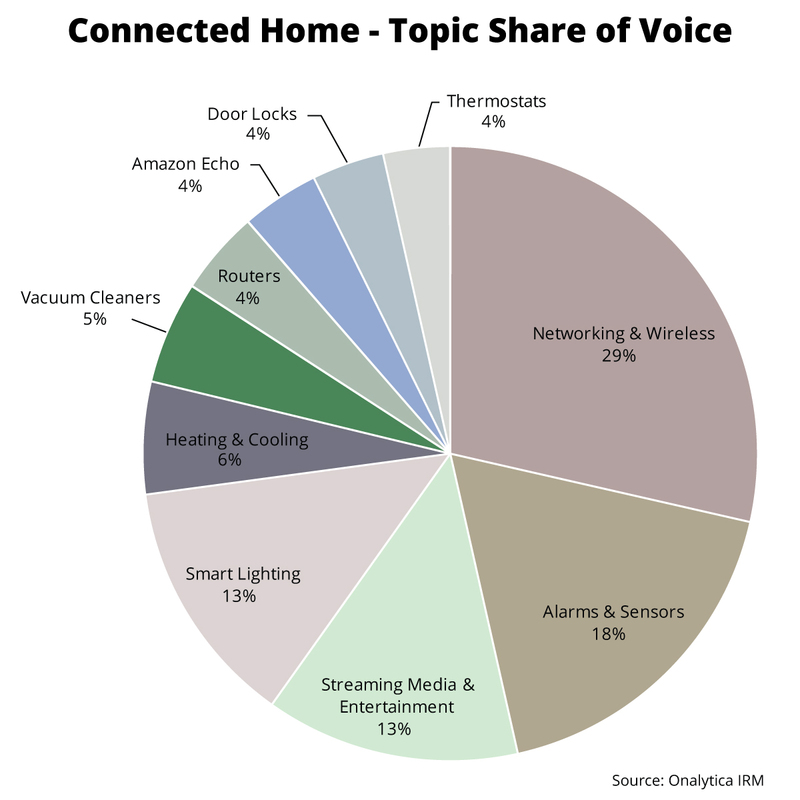 The most popular topic mentioned in tweets and blogs by the top connected home influencers was Network and Wireless with a 29% share of voice, illustrating the massive importance of wifi and networking within the connected home space. Alarms and Sensors was the 2nd most popular topic with 18% of all topic mentions, proving how important home security is in the context of connected home. The 3rd most popular topic was Streaming Media and Entertainment with a 13% share of voice, whilst the topic of Smart Lighting received a 13% share of voice. Heating and Cooling received a 6% share of mentions, followed by Vacuum Cleaners with 5%. 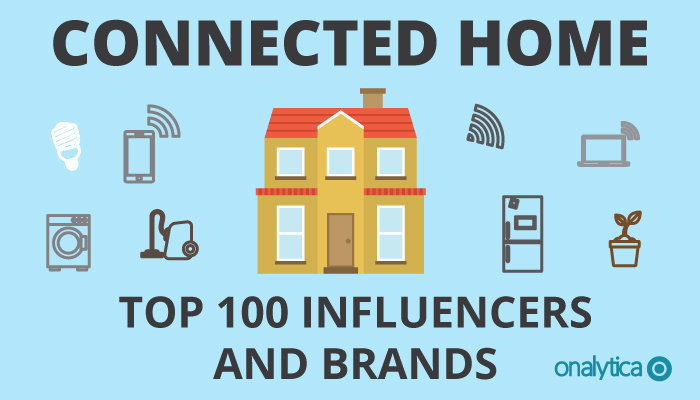 The topics of Routers, Amazon Echo, Door Locks and Thermostats all received a 4% share of mentions among the top 100 connected homeinfluencers and brands. We were very interested in seeing which brand and individuals were leading the discussion around connected home, so we analysed over 53K tweets mentioning the key words: “Connected Home” OR “Connected Homes” OR connectedhome OR connectedhomes OR “Smart Home” OR “Smart Homes” OR smarthome OR smarthomes from the 20th August – 20th October 2016. We then identified the top 100 most influential brands and individuals leading the discussion on Twitter. What we discovered was a very engaged community, with much discussion between individuals and brands. Below you can see a network map of the online conversation with number one individual Evan Kirstel at the centre. This map was created with our Influencer Relationship Management software (IRM). Be sure to click on the map to enjoy the full size network diagram in greater detail. 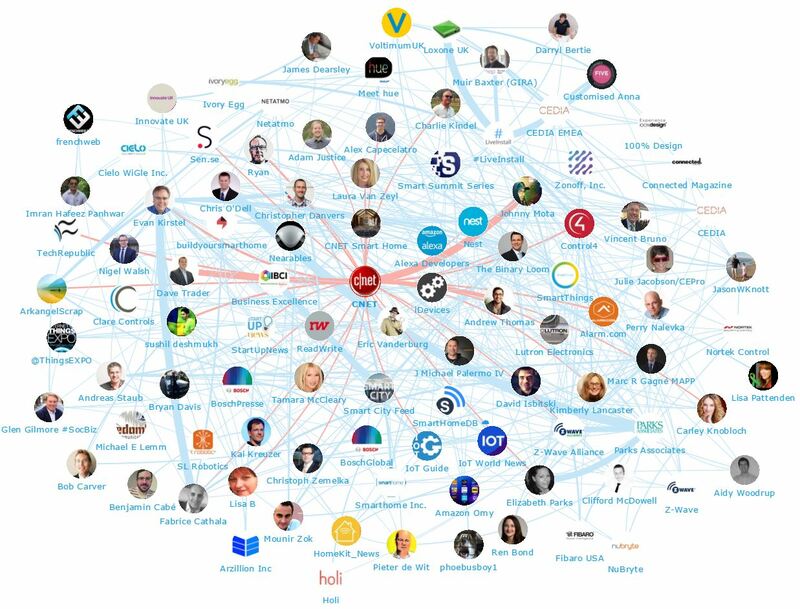 Below you can see another network map created with our Influencer Relationship Management software (IRM) showing the number 1 brand CNET at the centre and all the conversations to and from the influencers in their field. If you are interested in learning more about identifying, managing and engaging with influencers click here to get in touch! 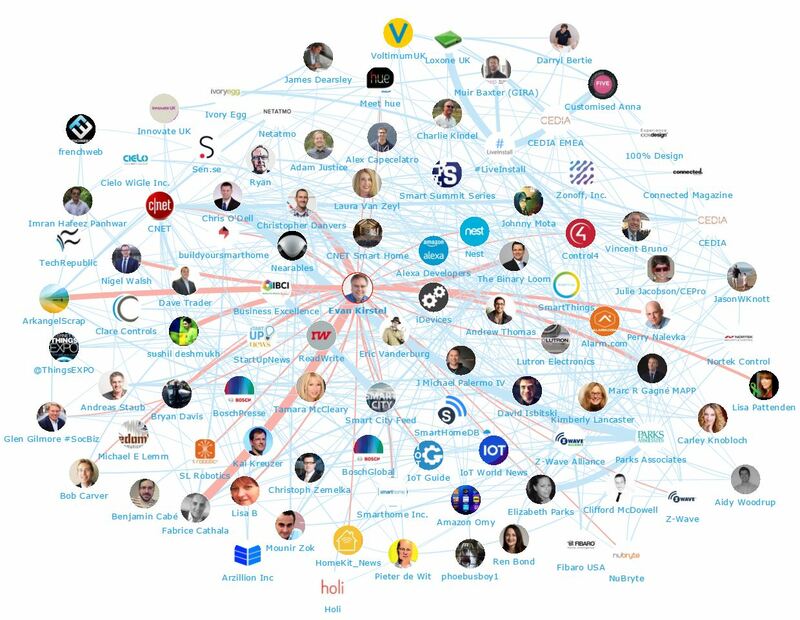 We looked at all the individuals engaging on Twitter to bring you a list of the top influencers in connected home. Below is the top 50, if you want to see who ranks from 50-100 be sure to download the full report by clicking the download button below. We also looked at all the brands engaging on Twitter to bring you a list of the top brands talking about connected home. Below is the top 50, if you want to see who ranks from 50-100 be sure to download the report to get the full top 100 list, and see who are most the influential brands in connected home. Disclaimer: As ever with these lists, it must be stressed that the ranking is by no means a definitive measurement of influence, as there is no such thing. The brands and individuals listed are undoubtedly influential when it comes to driving discussion around connected home.